News for Advanced Certified QuickBooks ProAdvisors + QB Power Hour is an ACE-Approved Provider! Intuit announced a new program for Advanced Certified ProAdvisors® to renew their Advanced Certification today. If you are Advanced Certified in either QuickBooks® Online or QuickBooks desktop, you need to complete Advanced Certified Education (ACE)-approved training to maintain and renew your Advanced Certified status. Specifically, effective May 22, 2016, Advanced Certified ProAdvisors must complete 9 CPE credits of ACE-approved training within 3 years of earning the Advanced Certified status and then every 3 years thereafter. Details and FAQs can be found here. I’m pleased to announce that QB Power Hour (hosted by myself – Michelle Long, CPA and Hector Garcia, CPA) is one the few ACE-approved training providers. Currently, the other ACE approved providers include Mario Nowogrodzki, CPA of Mendelson Academy and Scaling New Heights. QB Power Hour will be the only ACE-approved provider to provide ACE-approved training for FREE! QB Power Hour webinars are generally every other Thursday and we cover advanced topics for QuickBooks Online, QuickBooks desktop, value pricing, practice management and more. All webinars are eligible for CPE (for attendees who attend live and meet the requirements). There will be selected webinars (noted as ACE webinars) eligible for ACE-CPE credit as well. In order to provide FREE webinars, we will seek select sponsors (contact us if you’re interested in being considered for sponsorship). QB Power Hour webinars are targeted for CPAs, accountants, bookkeepers, tax professionals, consultants working with small business clients. Details and register for all QB Power Hour webinars up as a series of webinars so you can attend any or all by registering one time). This is the first of a 3-part webinar series for accounting professionals who are brand new to QuickBooks Online. This webinar begins with an introduction of Intuit and QuickBooks Online. It covers why small businesses and accounting professionals are moving to online solutions and the benefits of using QuickBooks Online. This is the second of a 3-part series for accounting professionals who are new to QuickBooks Online. This webinar begins with a demonstration of the QuickBooks Online Accountant “Your Books” feature, which is a free subscription to QuickBooks Online that is integrated within QuickBooks Online Accountant for the accounting professional to use. This is the last of a 3-part webinar series for accounting professionals who are brand new to QuickBooks Online. This webinar shows accounting professionals how easy it is to perform basic workflows in QuickBooks Online. If you’ve never been to an accounting conference, the 2016 Ultimate Accounting vCon is a great way to sample what it’s like without breaking your budget. It’s a 2-day virtual conference full of profit-boosting ideas from top-rated speakers and trainers on accounting practice management, technology, and marketing. It will be held May 12-13, 2016 with a chance to earn 12 CPE. And you never have to leave home. Feel free to forward this post to a friend! Do you wish you had a little (or a lot) more to show on your bottom line? Would you like to gain access (at no charge) to mentors’ secrets that lead to increased business profits, fun, and success? Do you wish you could attend an accounting training conference but simply can’t afford the registration or travel? If so, then take a break from your busy schedule next week and attend a fun and profit-boosting webinar, “5 Killer Ideas to Transform Your Accounting Practice” presented by dynamic accounting duo, Michelle Long and Sandi Smith Leyva, both CPAs and named the Most Powerful Women in Accounting by CPA Practice Advisor. Don’t wait; this webinar will fill up quickly. The accounting industry is changing and we must change how we operate to survive and thrive. Join Michelle Long for this 4 part series to become a firm of the future (FREE with free CPE eligible for attending live). – know the steps to take to become a firm of the future. – be able to select which QuickBooks is right for your clients and how to convert to QuickBooks Online. If you’ve attended before, we’d love to get a video testimonial from you about your experience at the event. By helping accountants decide to attend the event, you’ll be doing your part in helping to make the entire small business ecosystem, and therefore the economy, stronger. We’ll post your clip on the website and will use a few in a demo reel we’re putting together. We’ll list your website, which is great for search engine juice and your own publicity. You can record it yourself and send it to support@sandismith.com. Or if you’ll be at the Sleeter Conference next week, we will record you. Just drop by the Accountant’s Accelerator table in the Exhibit Hall for five minutes on Wednesday and we’ll get your testimonial recorded so you can get back to the conference. Did you know about Intuit’s Firm of the Future website? Have you heard accountants and bookkeepers everywhere talking about being a firm of the future and the need to transform their current practice to survive in the future? Have you wondered what a firm of the future is? Why do I need to be a firm of the future? How do I become a firm of the future? Attend this free webinar and we will help answer many of these questions for you. Communications Director) and Kim Amsbaugh (Intuit Corporate Communications) joining me to help answer your questions. 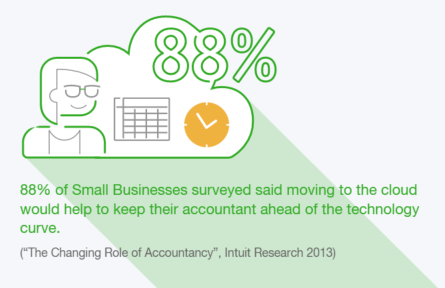 • Interesting statistics that demonstrate how technology is changing the accounting industry and how small businesses operate. Register: https://attendee.gotowebinar.com/register/7207494799158353666 – login early because space is limited. Can’t attend at that time? Register anyway so you’ll get an email with a link to the recording. Register with the same link for all QB Power Hour webinars. Please share this with your peers and let them know about QB Power Hour too!